Today's homeschooling victory to celebrate is friendship. Did you have a best friend while growing up? Do you have one now? How do they influence your life for the better? Some people can have a seemingly endless supply of close finds, and others of us only have a handful of those friendships. No matter how big or how small your inner circle of friend is - they are a valuable treasure - hold on to them! Friendship is a relationship that requires both people to give, but both can receive so much more than they give. Intimate friendships are often hard to cultivate in this busy world, and that is why I'm focusing on friendship as one of our homeschooling victories to celebrate. I'm celebrating because even after all of these years, our daughters are not just sisters, but friends. In a traditional school setting it is often hard to cultivate a friendship with someone not in your grade, because the nature of the age-graded classrooms separate you. In home education, your children can cultivate friendships with other children of a variety of ages, and even with adults. Our children learn their model of what friendship is from watching us interact with others. When we call someone our friend, they store up the ways that they see us interact with that person as their definition of friendship. More is caught than taught. You can read all the picture books in the world about friendship with your kids, but if they never see you interacting with your own friends, your children may not think true friendship is important. We must choose to take time to invest in our friendships as adults, and we need to include at least some friends that come with families attached so our families can interact and our children see what true friendship entails. 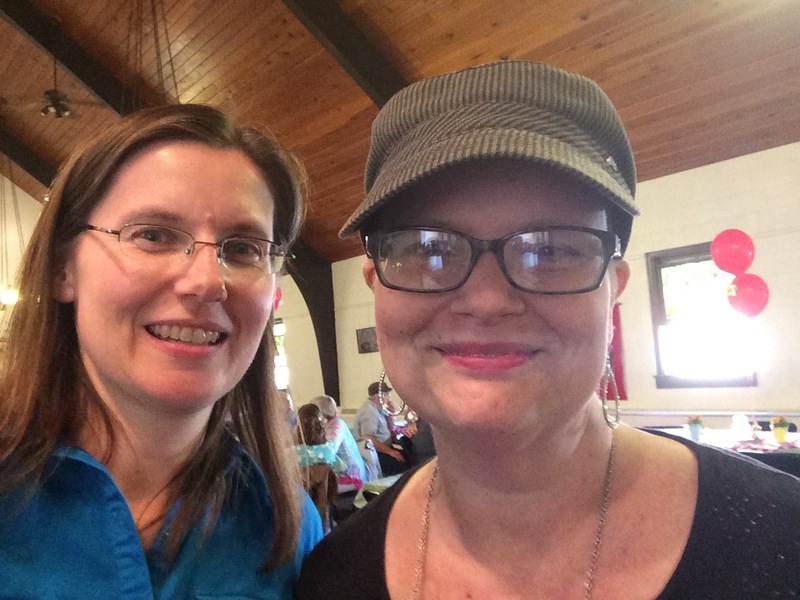 Good friends are often called the "family you choose" and that has been no truer than with my friend Sharra who passed away last year after a battle with cancer. She was the arms and feet of Jesus to so many people, and she shared her love for Jesus with everybody. Our friendship impacted not only myself, but our entire family for the better. She was a big cheerleader for our daughters, and they miss her too. Her memorial service was attended by hundreds of people who she had impacted - most of whom called her a friend. I often think of friendship in light of the things God taught me through my friendship with Sharra. Whatever the situation, she always pointed me back to seeking out and following God's path for my life. When I look at the friendships our daughters have been able to cultivate over the years, I am reminded of the joy that having a close friend brings. Today, as young adults, our daughters choose to spend time together because they are not just sisters, but friends. They share a lot of the same group of friends, but they also have individual friendships that do not overlap. When I think about how it affects me to spend time with my friends, and how much better I feel about life afterwards, I am encouraged that our daughters have friends who like being zany or serious with them as the moment requires. 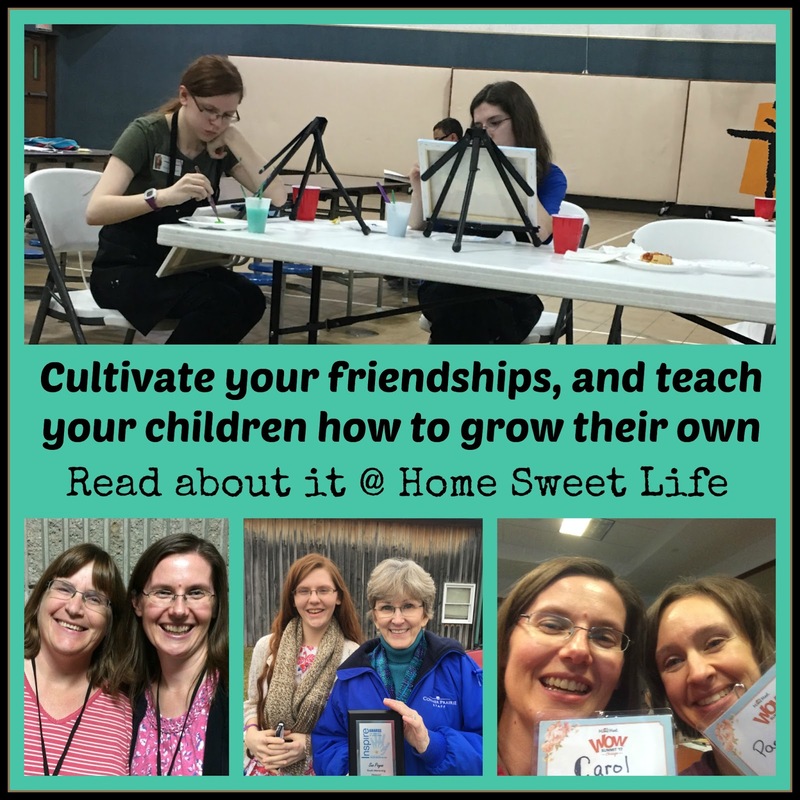 Our daughters have the gift of friendships outside of their own age ranges too, and that I credit to the many opportunities they have had as homeschoolers. We have had the physical time to make the emotional investment into the lives of other people, and other adults have invested in our children as well. Our daughters have friends that are much older then they are, some even older than Kurt and I are, these friendships have often grown from a mentoring situation, or an interaction of sharing the love of Jesus with others, both inside our church and out. The girls also have younger friends, ones that they are mentoring, or just enjoy spending time with. While I am so very thankful for their friends that are in/ around their own age group, I am thankful they understand the value of cross-generational friendships as well! Because of the flexibility of home education, our daughters, who would be two years apart in a traditional school, and worlds apart in the social scene at a public school, have experienced life together. Bonds have been forged that tie them together in a way only God could orchestrate. Yes, they do still ague at times, but what holds them together is so much stronger than anything that threatens to tear them apart. For those of you reading this who are one of those friends of part of or all of our family - thank you! We are so blessed to be able to make time for the important things of life along this home education journey and beyond - and finding you as our friends has been one of the many highlights, and victories, we have celebrated along the way!